Peach season is in full swing here in Georgia. On a recent trip my neighborhood farmers market, tasting just one slice of a perfectly ripe peach convinced me to take a bag of them home. That impulse buy left me with just a few days to decide what to do with all of that fruit. See I already had a fridge full of blueberries, cherries and strawberries. When I saw this month’s recipe redux challenge to cook with spirits… I decided to cook the peaches for dessert with a little liqueur. It’s summer. Time to turn down – at least in the kitchen. Maybe I’m a little lazy in the kitchen these days but I still want great food. Luckily perfectly ripe peaches do all of the work here. Just 3 ingredients (see the little sugar sprinkle spill?) 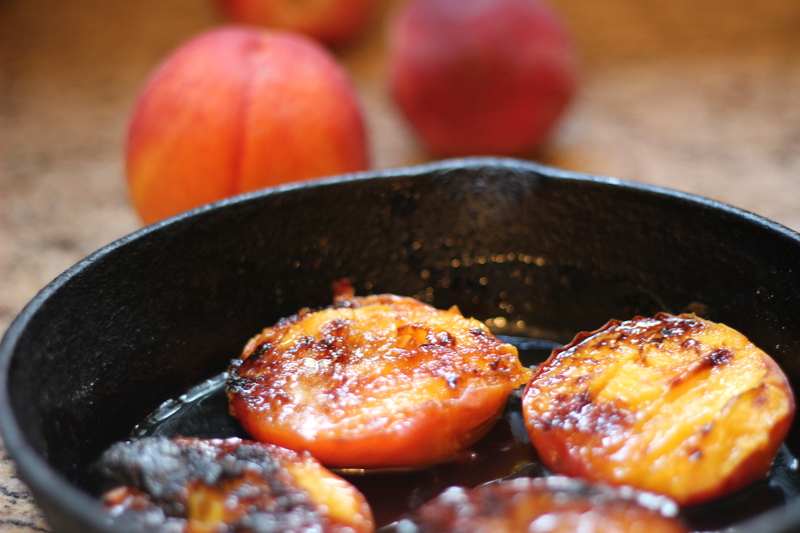 make a decadent dessert that allows fresh peaches to really shine. See that syrup at the bottom of the skillet? That’s some good stuff. Drizzle a little syrup over the top and enjoy as is or with a dollop of cream. Pour the orange liqueur over the peaches. Sprinkle the sugar evenly on top of the peaches. 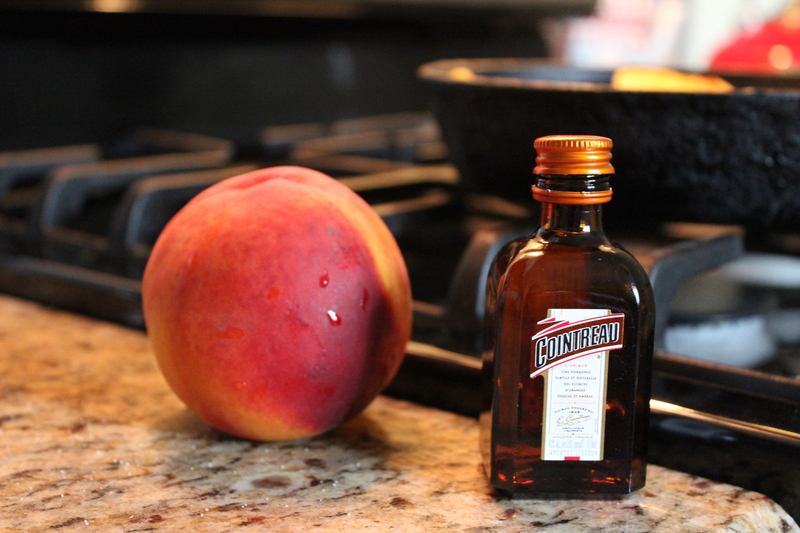 Cook the peaches on top of the stove over medium-high heat to allow some of the alcohol to cook off, about 3 minutes. Transfer the skillet to the broiler. Serve 2 peach halves per person with a drizzle of the syrup and Georgia pecans, fresh whipped cream or a dollop of yogurt for a light dessert. Recipe adapted from an Amaretto Roasted Peaches recipe from the Splendid Table - my favorite NPR show.